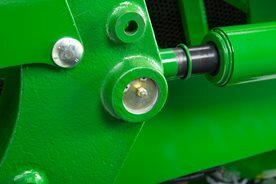 All pivot points on the loader have grease fittings that are accessible from the side of the loader to make greasing the loader much easier, ensuring that all grease points are more likely to be serviced. No more searching for grease points that are hard to find. Removing the grease gun from the grease fitting is not a problem as sufficient radius has been left to allow the grease gun tip to be rotated to the side for removal from the fitting.